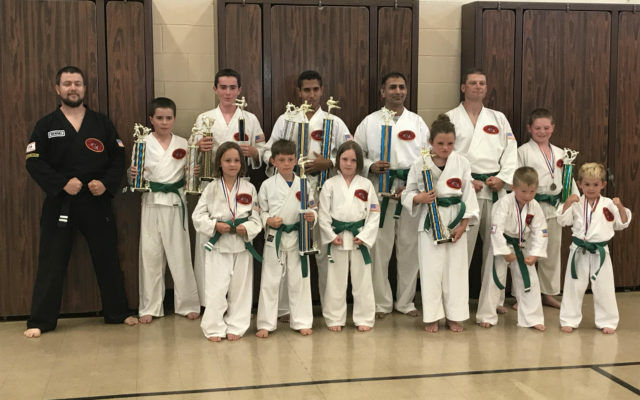 The Graves’ Institute of Self Defense 27th annual Summer Kick Off Karate and Jiu-Jitsu Tournament featured wonderful weather, exciting competition and stands filled with enthusiastic spectators. MARS HILL, Maine — The Graves’ Institute of Self Defense 27th annual Summer Kick Off Karate and Jiu-Jitsu Tournament featured wonderful weather, exciting competition and stands filled with enthusiastic spectators. Held June 16 at the Central Aroostook Junior-Senior High School gymnasium, the only martial arts competition north of Bangor, and one of only seven in the entire state, proved enjoyable, entertaining and rewarding for everyone involved. Competitors ranged in age from 5 to 68 and traveled from throughout Maine, Massachusetts, New Hampshire and New Brunswick to attend. Nine-year-old Haidyn Saucier, a green belt from the Fort Kent dojo, got the tournament underway by singing the National Anthem, and for the next four hours it was steady action in the six event rings. Matches in point sparring, form kata, weapons kata, Jiu-Jitsu throwing teams and power impactor took place with competitors divided by age, weight, gender and belt color, which denotes experience level to assure fairness. Sparring matches were comprised of random pairs in a single elimination format lasting two minutes or to three points, with the winner moving on. Several groups featured as many as 20 competitors so the top three trophy spots were highly contested with winners needing four or five matches to come out on top. Jiu-Jitsu matches were comprised of throwing pairs, each demonstrating three defensive throws or take-downs after being attacked. Each routine was judged on a 1 to 10 scoring scale in 1/10 increments by five judges, then the high and low scores were dropped and the other three totaled for a final score. There were many very close matches. As with most martial arts tournaments, the culmination of events were the black belt competitions and the awarding of several huge grand championship trophies. In the black belt Jiu-Jitsu, twin brothers Dylan and Dustin Coty of Caribou pulled off the rare feat of winning two years in a row. Their set of difficult aerobatic, acrobatic and athletic throws were scored a full point higher than any other of the black belt pairs routines. In the men’s 17-34 year old fighting, the final duo paired Sensei Jonathan Robinson of Graves’ Island Falls branch against Sensei Noah Jackins of Graves’ Houlton dojo. After a well fought match with many great kicking combinations, Jackins pulled out the victory by a 3-2 score for the grand championship trophy. Sensei Linwood Bridges of Belfast won the Men’s Senior black belt division and Sensei Jay Peavey of the Mars Hill branch topped the field in men’s Executive fighting matches. In another exciting 3-2 point match with spectacular kicking techniques, Bridges garnered the Grand award. In women’s black belt fighting, Sensei Sadie Hartt of Graves’ Island Falls class sparred her way to first place and the Grand championship. Sadie’s sister, Charlotte Hartt, is also a black belt and won her Junior black belt division. The sisters then joined forces to win their black belt Jiu-Jitsu division. To keep the family winning on track, Sensei Andy Hartt, the girls’ father, took second place in men’s black belt sparring. Other family winners included siblings Gwen and Kieran Everett from the Graves’ Perth-Andover, New Brunswick, dojo. They not only won first place in Junior Brown Belt Jiu-Jitsu, but both students went on to each capture first place in their respective sparring categories. Chiag Patel and his son Aryan of Fort Kent combined to win four trophies in throwing, fighting and power impactor. Other Fort Kent family winners included Caleb and Haidyn Saucier, Miguel and Rafel Sanclemente, and Jake and Samantha O’Clair. They all combined for multiple awards in their first tournament. Brown belt Joel Philbrook, his son Jack, also a brown belt, and green belt daughter Brooklyn all of Island Falls, combined for a family five-trophy day. Cousins Mallory Kingsbury and Jack McQuade of Mars Hill also enjoyed a memorable tournament with four trophies between fighting and throwing efforts. A large number of other regional students performed well enough to go home with a pair of awards and even more won a single trophy. Graves’ Ketsugo offers classes at eight dojos from Island Falls to Fort Kent as well as women’s self defense classes. Further information on these classes, as well as more photos and videos from the recent tournament, can be viewed on the Graves Institute of Self Defense page on Facebook. Sensei Andy Hartt teaches his students on Tuesday nights at 6 p.m. at the Fort Kent Elementary School gymnasium. For more information, call Hartt at (207) 745-8184.